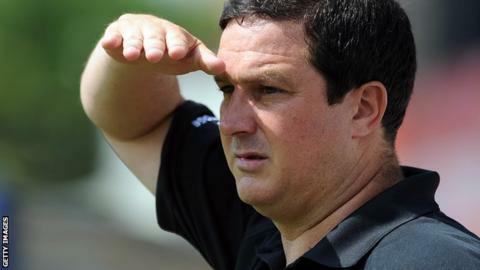 Mansfield Town manager Paul Cox has responded to calls for his sacking by arguing that he is one of the club's best-ever managers. The Stags have lost three of their opening five games, including Tuesday's 2-0 loss at local rivals Notts County in the Johnstone's Paint Trophy. Cox told BBC Radio Nottingham: "The win ratio of the team is unbelievable. "I think I'm up there with the top managers in the club's history. I have an immense faith in my own ability." He was appointed by chairman John Radford in May 2011 and led the club to the Conference title in the 2012-13 season. Cox has the second-best win ratio of any Mansfield manager since World War II at just over 50%, but that figure was only 35% last season, Cox's first in the Football League. He is not concerned that a small group of Stags fans chanted "Cox out" during the defeat against the Magpies. "The only person's opinion that I've been bothered about is the man that owns the football club," said Cox. "If Mr Radford turns round to me and says you're no longer manager of this football club, I'll accept that."